Improving the effectiveness of Human Rights Council resolutions is one of the Universal Rights Group’s current projects, and in that regard we are pleased to have contributed, through our empirical and qualitative research, policy dialogues, and side events with delegations from all regions and political groups, to the delivery of the following consensus based cross-regional statement led by Norway and Turkey. The cross-regional statement shows the benefits of addressing important and sensitive issues through dialogue and inclusivity, in line with the Universal Rights Groups’s core values (the 8 Is). The Universal Rights Group congratulates all those associated with the cross-regional statement. CROSS-REGIONAL STATEMENT ON IMPROVING WORKING METHODS IN THE HUMAN RIGHTS COUNCIL FOR ITEM 3, 14 March. I am honoured to make this statement on behalf of 61 states (Australia, Austria, Belgium, Botswana, Bulgaria, Canada, Czech Republic, Chile, Columbia, Costa Rica, Croatia, Cyprus, Denmark, Estonia, Finland, France, Gabon, Germany, Greece, Honduras, Hungary, Iceland, Indonesia, Ireland, Italy, Japan, Jordan, Latvia, Liechtenstein, Lithuania, Luxembourg, Maldives, Malta, Moldova, Monaco, Montenegro, Morocco, Netherlands, New Zealand, Nigeria, Norway, Pakistan, Panama, Paraguay, Peru, Poland, Portugal, Republic of Korea, Romania, Serbia, South Africa, Slovakia, Slovenia, Sweden, Spain, Switzerland, Thailand, Tunisia, Turkey, United Kingdom, USA). 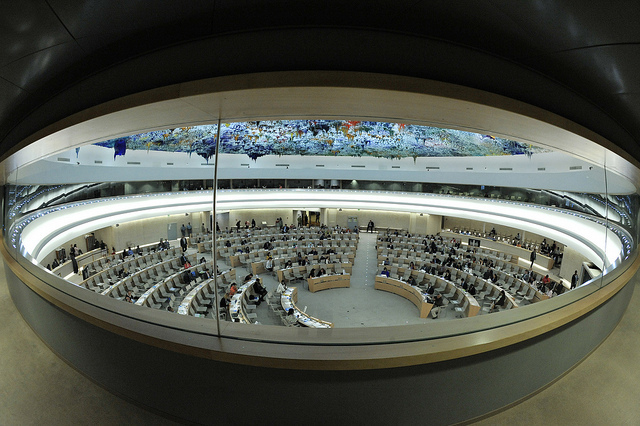 The Human Rights Council has proven its relevance and ability to contribute to the promotion and protection of human rights around the world. It continues to respond to a wide range of important human rights challenges, takes decisions that make a difference, including on technical assistance and capacity building, and establishes mandates that secure promotion and protection of human rights in many difficult and complex areas and circumstances. Cross-regional agreements on sensitive issues have also demonstrated the ability of the Council to bridge differences. The signatories of this statement note, however, that this success has come with its own set of challenges. First: The Council’s program of work has reached its limits in terms of available time. Second: The increase in numbers and length of resolutions may reduce their quality and effectiveness, especially in the absence of better implementation. Third: Draft resolutions are sometimes presented too late during sessions, preventing adequate analysis and consultation and thereby reducing the opportunity for States to provide input on the adopted texts. Fourth: The effective implementation of the high number of Council initiatives has resource implications. Fifth: The overlap of the work of the Human Rights Council with the Third Committee is increasing, raising questions of the optimal use of time and resources. 1) The 24th session of the Council witnessed a record number of resolutions and decisions: 39. 2013 also saw a record number of texts: 107 in total. 2) The length of resolutions is also increasing. The average length of resolutions (word count) has increased by over 25% in the last two years. The preamble of a resolution has come to represent over 40% of the text. 3) Analysis shows that in 2012-2013 over 40% of human rights resolutions in New York and Geneva had some degree of substantive overlap, and 13% of resolutions were almost identical. 4) The number of panels per year has almost doubled since 2009. Mr. President, It is important for all delegations to work together, in a spirit of compromise and consensus, to respond to these challenges, bearing in mind Council resolution 5/1 on the Institution-building Package of the Human Rights Council and resolution 16/21 and its annex on the Review of the work and functioning of the Human Rights Council. With that in mind the cosponsors to this statement share the common ambition to voluntarily take the following steps, without prejudice to the rights of states recognized in paragraph 117 of the annex to Council resolution 5/1. – In line with paragraphs 48 and 49 of the annex to Resolution 16/21, show restraint in resorting to resolutions, and look to table recurring thematic resolutions on a biennual or triennial basis. This is without prejudice to urgent issues and to scheduled mandate renewals. – In line with paragraph 117 of the annex to resolution 5/1 and paragraph 52 of the annex to resolution 16/21, notify delegations of draft texts before or at least during the first week of the session. – Shorten the length of resolutions and avoid repetition. – In line with paragraph 117 of the annex to resolution 5/1 minimize unnecessary duplication of initiatives with the General Assembly/Third Committee. – Keep in mind the capacity constraints of the Council when launching new initiatives. – Make better use of the other work formats mentioned in paragraph 115 of the annex to resolution 5/1, such as seminars and round tables.